Whenever I go home to Cavite, I try, as much as possible, to visit new food joints while spending time with my folks and/or my childhood friends. 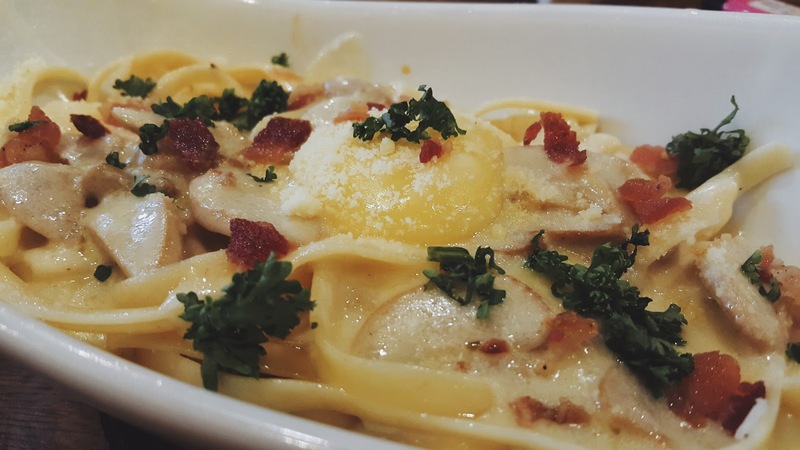 It still amazes how much the food scene has grown in Cavite! 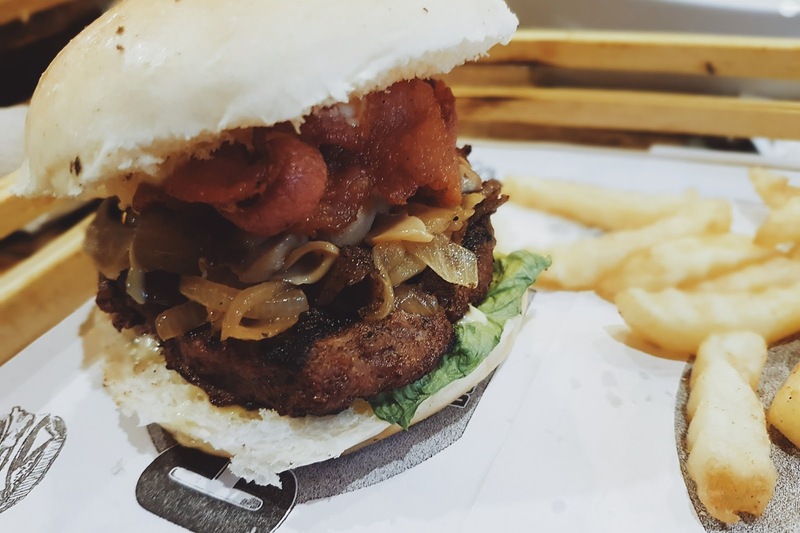 Before, Tagaytay has always been the go-to place in Cavite for the gastronomically adventurous, but spots have sprouted here and there in other areas like Kawit, Imus and Bacoor! 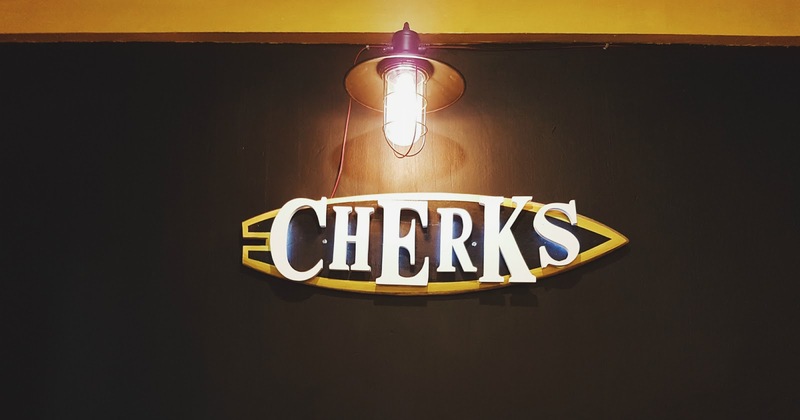 For this week's #WhenInCavite, Cy and I had a quick late lunch at Cherk's Burger Cafe in Imus. I saw another friend's food posts about Cherk's on Instagram and decided to pay them a visit last Saturday. I forgot to take photos of the interiors because I was just too excited to eat. The things I noticed though are I think their pantry's located at the second floor because we kept on seeing food come down from their second storey. Cherk's was also reminiscent of The Black Apartment's aesthetic (predominantly black colors -- though Cherk's has a splash of yellow, wooden tables and chairs, presentation-wise as well) but I'm not entirely sure which one was first to do this. I've been very curious with the black buns (remember when Burger King launched the kuro burger in Japan and got everyone intrigued?) so I opted for the Ultimate Mac-Cheese Burger -- that, and obviously, the very thought of having mac and cheese in your burger. Carbs on carbs! 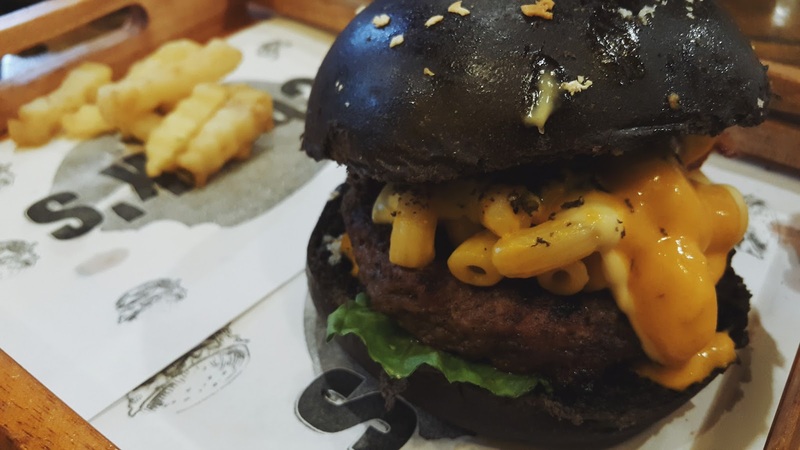 Fun fact: What makes the bun black is actually squid ink (or from what I read, a combination of squid ink and bamboo charcoal for others) so don't worry about some weird chemical coloring incorporated in your food. Now while it's great to always bring something fresh and exciting to the table, this is one of the food fads that I don't (and I think will never) understand. I should've asked what this very artificial looking bun would taste like because it doesn't taste any different from the usual burger buns. I tried it for the sake of trying but would never avail of it again, maybe the same components sans the black bun. It's actually not bad just to be clear, but it isn't any better either. On the other hand, the mac and cheese x burger patty combination was a winner. I will never complain about the extra cheesiness! Cy and I both really liked their Carbonara Capellini. It was light and creamy and delicious (bacon, yesss!) and of course that sunny side up egg is the bomb. I've always preferred cream-based pasta, but this version is so much better because of the richness the egg brings. (Wish they'd use angel hair pasta in the future!) Simple but yummy! Lastly, Cy's Butcher's Burger. It's quarter pound burger patty with smoked bacon, juicy sukiyaki beef and cheese. She said it was flavorful and very, very filling but thought that there was no cheese in her burger. Haha! She even posted this Instagram photo to express her disappointment. LOL. The only issue I had was with their fries. The serving size was inconsistent (Cy had more! LOL I know that sounds petty but consistency is key) at the same time, too small. Overall, it's still a good dining experience. Prices are not too steep and the customer service was great. Since Cherk's is near the Imus Cathedral, it's a good place to eat after hearing the mass with your family or friends. You can view their menu by clicking here.